The numbers are staggering. Hurricanes Harvey and Irma inflicted between 150 and 200 million dollars in damage to Texas and Florida alone. That’s to say nothing of the human cost — thousands of lives disrupted, people displaced and homes destroyed. The situation is even worse in U.S. territories in the Caribbean. Hurricane Maria essentially destroyed all of Puerto Rico’s infrastructure. Recovery from all three hurricanes will take years — which is exactly why the Disaster Services Corporation of the Society of St. Vincent de Paul USA is there to help. While the Society of St. Vincent De Paul is a Catholic Charity focused on the needy and suffering that has been around for more than 150 years, the group’s Disaster Services Corporation was born just 12 years ago out of the crisis created by Hurricane Katrina. In this episode, you’ll hear how an unexpected announcement during that disaster caused the organization to take unprecedented steps to help evacuees in an entirely new way. You’ll also learn how a program created back then will bring comfort to the tens of thousands of people impacted by this year’s torrent of hurricanes. Along the way, you’ll meet the leader of SVDP Disaster Services, Elizabeth Disco-Shearer. She was a successful businesswoman, but changed everything in her life after she made a deal with God — and God held up his end of the bargain. Find out what her promise was, how it ultimately led her to lead an organization that’s helped thousands of traumatized people put their lives back together. Tune in now. Want to hear about another incredible organization doing disaster relief? 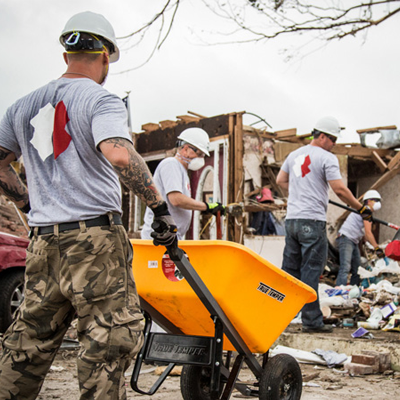 Then check out our episode with Team Rubicon, where military veterans re-purpose their counterinsurgency tactics to instead help people recovering from a crisis. You’ll meet Jake Wood, the former Marine and Iraq war veteran who founded the organization, and learn how helping those in need has also helped America’s veterans find their place in the civilian world. Listen here.